Video Premiere / Jackie Greene / "Tupelo"
Today we’re debuting the new video for “Tupelo,” from Jackie Greene’s 2017 EP The Modern Lives Vol. 1. It’s also the lead track from his new Live From Town Hall album. The video features the animation of Bill Plympton, long known for his work on MTV’s Liquid Television, Kane West’s “Heard ‘em Say” video, and his own Oscar-nominated short, Your Face. “Tupelo” is a bluesy, ambling Americana tune with lots of soul. It starts simply with a bass and drums before adding piano, banjo, and Greene’s friendly vocals. This tale of regret about being drawn in by the siren song of Tupelo’s seedy side even strolls into spiritual territory (on the live version), venturing through “Wade in the Water” towards the end. 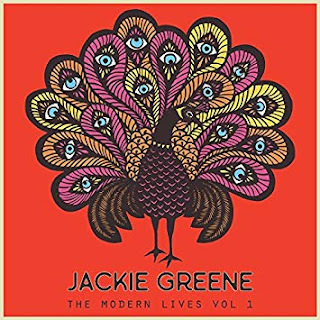 Give it a listen and check out more information about Jackie and The Modern Lives Vol. 1 after the video. RIYL: Justin Townes Earle, The Band, The Black Crowes’ gentler moments. From Jackie: "It was such a joy to work on this project with Bill. He’s a crazy genius and I love crazy geniuses. This is a song that I originally wrote as a piano song, but it morphed into a banjo song. How it got there is a tale for another time. For now, enjoy the video!" Hailed as "the Prince of Americana" by the New York Times, Jackie Greene has emerged as one of his generation’s most compelling songwriters and guitarists, the kind of rare and supremely versatile artist who blends virtuosity and emotional depth in equal measure. Greene’s latest release, 'The Modern Lives – Vol 1,' finds him relocated from the Bay Area to a Brooklyn basement, where he recorded every single instrument himself in addition to serving as his own engineer and producer. Gritty and rollicking, the songs are as exuberant as they are incisive, drawing inspiration from some of the great social paradoxes of our time: that the technology designed to simplify our lives can actually complicate them in ways we'd never imagined, that the most crowded cities can actually be the loneliest places to live, that the networks meant to connect us to can actually leave us feeling more isolated than ever before. Greene's been chasing a sense of authentic human connection through art ever since his teenage years, when he began self-recording and releasing his own music in central California. After a critically acclaimed independent debut, he signed his first record deal and embarked on a lifetime of recording and touring that would see him supporting the likes of BB King, Mark Knopfler, Susan Tedeschi, and Taj Mahal, in addition to gracing festival stages from Bonnaroo to Outside Lands. The New York Times praised his "spiritual balladry," Bob Weir anointed him the "cowboy poet" of Americana and blues, and the San Francisco Chronicle raved that he has "a natural and intuitive connection with… just about any musical instrument." While Greene's songwriting chops were more than enough to place him in a league of his own (NPR's World Café raved that his "sound seems at once achingly intimate, surprisingly energetic and unburdened by adherence to genre"), Greene also emerged as a singular singer and guitarist, prompting Rolling Stone to praise his "honeyed tenor" and name him among "the most notable guitarists from the next generation of six-string legends." Between studio albums and his own tours, Greene took up prestigious gigs playing with Phil Lesh & Friends, The Black Crowes, Levon Helm, and Trigger Hippy, his supergroup with Joan Osborne.